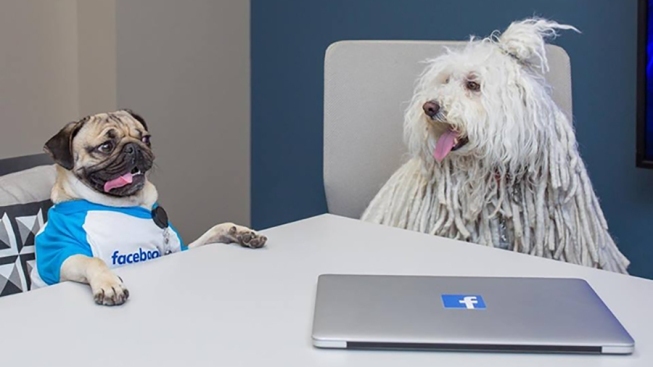 Doug the Pug and Beast Zuckerberg talking serious business at Facebook headquarters. Two social media powerhouses joined together for a business lunch at Facebook's Menlo Park headquarters on Thursday, no doubt striking a few business deals, comparing notes on the best brands of dog food, and arguing over who really is the internet's favorite dog. The dress code was, ahem, collar optional. Beast Zuckerberg, sporting a professional top-knot (or is it a dogbun? ), invited social media star Doug the Pug for a sit down chat. The meeting's minutes and agenda were not released to the public, so there's no way to know for sure what the pooches were plotting. "Apparently Beast had an important meeting at the office today with Doug the Pug," Zuckerberg wrote on Facebook. "They agree that Facebook needs more kibble and belly rubs. Beast also wants some sheep." After their clandestine luncheon, Doug the Pug used his vast social media following to share a picture of the new business buddies, although Doug couldn't help throwing a little shade in the process. Beast has yet to respond to this potential dig via his personal Facebook.